Hytera DMR radios are designed to withstand harsh environments, whether that is extremes of heat and cold, being dropped on a warehouse concrete floor, or needing to resist dust and moisture penetration. Whatever the environment, you can rely on a Hytera radio to keep working without failing. The DMR portfolio offers a range of ruggedised options, so you can find the right radio for the job you do. All Hytera radios are certified using the US Military Standard (MIL-STD) and the IP Code, so you can tell just how rugged each model is and whether it has the appropriate degree of protection required for the job. So, what are these certifications and what do they mean? The US MIL-STD-810 is a series of environmental engineering considerations and laboratory tests devised on behalf of the US military to test equipment environmental design and limits in the kinds of conditions it is expected to be subject to throughout its life. It also sets out the test methods designed to replicate the effects of these environments on the equipment. MIL-STD-810 does not proscribe the design or test specifications. Instead it sets out the environmental tailoring process with the aim of providing realistic materiel designs and test methods based on materiel system performance requirements. Although it was originally drawn up for use with military applications, the standard is often used for commercial products as well. MIL-STD-810 has been widely adopted by the commercial two-way radio industry to provide customers with an easily understandable ratings system and give them confidence in the radio’s environmental performance and durability by using an independent testing methodology. ● Demonstrate compliance with contractual requirements. MIL-STD-810 covers a wide range of environmental conditions including: low pressure for altitude testing; exposure to high and low temperatures plus temperature shock (both operating and in storage); rain (including wind blown and freezing rain); humidity, fungus, salt fog for rust testing; sand and dust exposure; explosive atmosphere; leakage; acceleration; shock and transport shock; gunfire vibration; and random vibration. In the two-way radio world, MIL-STD-810 is particularly used to test and indicate a radio’s resistance to temperature, drops, shock and vibration. The IP Code (International Protection or sometimes Ingress Protection) is a system drawn up by the International Electrotechnical Commission (IEC) to “classify and rate the degree of protection provided against intrusion (body parts such as hands and fingers), dust, accidental contact, and water by mechanical casings and electrical enclosures”. The equivalent European standard to IEC 60529 is EN 60529. The IP Code consists of the letters ‘IP’ followed by two numbers and sometimes an optional letter. IP stands for Ingress Protection. The first number indicates the level of solids protection, including intrusion by body parts like hands and fingers, dust, and accidental contact; and the second number indicates the level of liquids protection in electrical enclosures. The aim is to provide a much clearer guide to users than vague terms such as ‘waterproof’. ● 5: Dust Protected – ingress of dust is not entirely prevented, but it must not enter in sufficient quantity to interfere with the satisfactory operation of the equipment; complete protection against contact. ● 6: Dust Tight – no ingress of dust; complete protection against contact. ● 4: Splashing water – water splashing against the enclosure from any direction shall have no harmful effect. ● 5: Water jets – water projected by a nozzle (6.3mm) against enclosure from any direction shall have no harmful effects. ● 6: Powerful water jets – water projected in powerful jets (12.5mm nozzle) against the enclosure from any direction shall have no harmful effects. ● 7: Immersion up to 1m – ingress of water in harmful quantity shall not be possible when the enclosure is immersed in water under defined conditions of pressure and time (up to 1m of submersion). ● 8: Immersion beyond 1m – the equipment is suitable for continuous immersion in water under conditions which shall be specified by the manufacturer. Normally, this will mean that the equipment is hermetically sealed. However, with certain types of equipment, it can mean that water can enter but only in such a manner that it produces no harmful effects. 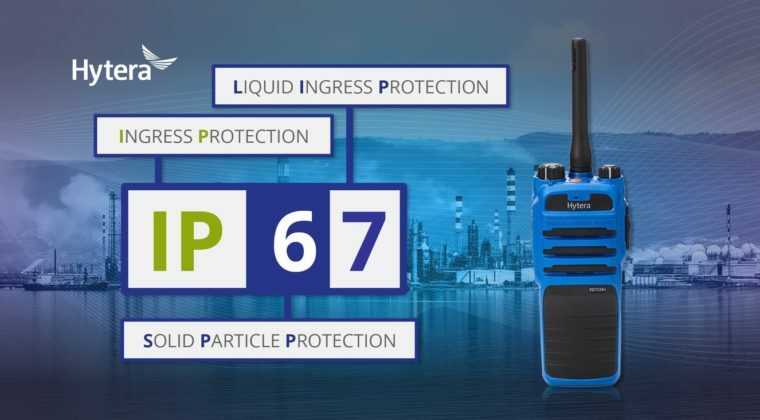 What this boils down to is that if a Hytera DMR radio is IP67 rated that means it is protected from total dust ingress and protected from immersion between 15 centimetres and 1 meter in depth. If it is IP68 rated it is protected from total dust ingress and from long term immersion in water (up to 30 minutes) up to a specified pressure.